providing services to the oil and gas industry since 1895. Today, W.M. Dewey & Son, Inc. provides comprehensive pipe services to both national and international firms that manufacture, distribute, and use drill pipe, casing and tubing. W.M. 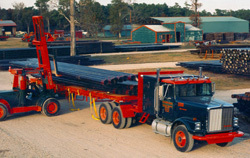 Dewey trucks “haul” custom pipe to their specified destinations, including the storage yards at W.M. Dewey, distributor yards, wellheads, dock yards, rail yards, and more. Additionally, W.M. Dewey provides services for domestic, export, and import cargoes, owns two pipe storage yards, and can coordinate on-site third-party pipe services. All of these services uniquely position W.M. Dewey to meet most oilfield pipe needs. At W.M. Dewey, we understand the risks that accompany transporting and storing pipe, and have built our company around values and processes designed to minimize these risks. With an entirely company-owned fleet, an operator base of all in-house employees, a standard liability insurance policy 10x the legal requirement, and one of the highest safety ratings provided by the U.S. Department of Transportation (DOT), safety is at the core of everything we do.